Camping l’Etoile de Mer is a 3 star campsite located in Serignan in the Languedoc region of France. Camping l’Etoile de Mer is a fantastic little campsite which occupies a wonderful position just 300m from the nearest sandy beach at Serignan-Plage. The campsite is set within beautifully landscaped grounds where colourful plants and green leafy trees border the pitches and other amenities. This wonderful addition provides a real exotic and luxurious feel to the campsite along with some welcome shade from the summer sun. As we’ve mentioned above, the nearest beach to Camping l’Etoile de Mer is literally 300m away and takes a little over 5 minutes to walk to. Once on the beach you’ll find it stretches out for miles in either direction and although busy during summer months, you’ll still be able to find plenty of space to relax, sunbathe and most importantly of all, have fun. The beach also shelves gently into the warm Mediterranean sea offering the perfect place for families to swim. 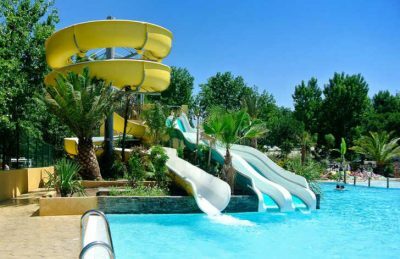 Camping l’Etoile de Mer is a family friendly campsite and as such offers a fantastic swimming pool area. Covering around 1400m2 the water park features a heated lagoon styled pool with colourful plants, children’s pool with water jets, several water slides for older children and adults and plenty of pleasant seating areas where you can relax and sunbathe. Camping l’Etoile de Mer campsite is a lovely family friendly campsite which offers a variety of activities to ensure you have a great holiday. On site activities at Camping l’Etoile de Mer campsite include multi sports area, football, basketball, table tennis, boules and a playground. Facilities available at Camping l’Etoile de Mer campsite include WIFI, restaurant, snack bar, takeaway, bar, groceries, animation team, games room, washers and dryers. Accommodation at Camping l’Etoile de Mers campsite includes a range of 2 bedroom mobile homes that are available. When you’re ready, booking Camping l’Etoile de Mer is quick and easy with Go Camp France!